The single will be available on 2x CD singles and a 7" vinyl. They will not be playing live in Southampton and Shrewbury but will have a prize draw to win some copies of the new album, video's, t-shirts and signed memorabilia. 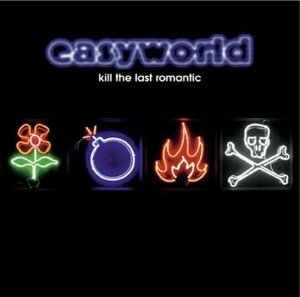 The new album, "Kill the Last Romantic" will be released on the 2nd of Feb. Yes, still going on about our American cousins. this time no guns and fast food but a reminder of the westward drive that lent a geographical totality to the USA. so where next. We were considering this at the time of the album session but I took ages over the words and it got shelved. This is an up-tempo, noisy rock&roll track especially for those who complain about the lack of up-tempo, noisy rock&roll tracks in our current repertoire. The new winner of shallowest moment competition. Love it and hate it. Sounds loosely borrowed from the last Johnny Cash album (he wont mind) but a nice tune and a lyric about the joy of getting over it. All I remember about metaphysical poetry from school is that it all seemed like a collection of stupid arguments designed to get women into the sack. Smoky jazz seemed a far more appropriate style for this type of sentiment. This is, of course, not our most fluent musical genre but hey, it's a b-side and in the spirit of adventure, features my world debut trombone solo. There will also be the traditional cover version too."